What animal uses stilts, has room mates, finds safety in numbers, and even gets skin treatments at the spa? FISH! While they might seem as different from humans as animals can possibly be, we actually have a lot in common with our underwater neighbours. From hunting to homemaking to dressing to impress, fish are a lot like us - though with fascinating twists all their own. Factual, funny, and featuring a dynamic mix of photographs and cartoon illustrations, Just Like Us! 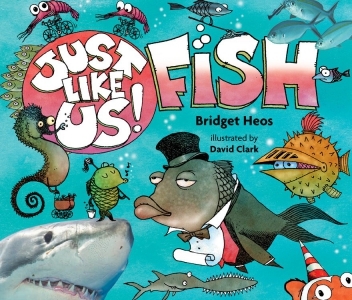 Fish will charm even the most reluctant nonfiction readers. Get the facts on an array of aquatic creatures and discover the unexpected ways humans and fish are alike in this installment in the Just Like Us! series from Bridget Heos, author of Mustache Baby and Shell, Beak, Tusk. With an appealing mix of photographs and cartoon illustrations.